In order for businesses to provide safe environments for their employees, it’s important that an effective safety culture is established. The importance of safety in the workplace has rightfully been on the rise in past years. In 2004-05 there were 135,515 reported serious injury claims throughout Australia, a figure that dropped to 113,965 in 2013-14. Similarly, the number of workplace fatalities dropped from 259 in 2003 to 182 in 2016. While this is definitely a move in the right direction, much of these reductions can be attributed to improved policies and technology over the years. The fact that injuries and fatalities remain in the workplace at all can be due to policies not being followed adequately and consistently – that is, the safety culture not aligning with the systems in place, and policies not being met with satisfactory action. There’s a range of benefits to establishing a leading safety culture. With workplace injuries costing employers approximately $1.6 billion annually, huge costs are saved if incidents are lowered. There is also a flow on affect as productivity improves and retention rates increase. 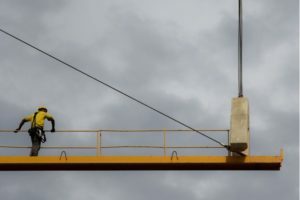 Furthermore, businesses benefit from a having a reputation of a positive safety culture as there is a growing interest in social responsibility amongst corporations in Australia. Nine broad behaviours have been identified by the Construction Safety Competency Framework as effective actions to develop a leading safety culture. The values and attitudes that a company holds towards safety need to be relayed to employees through health and safety policy statements, posters, talks, regular reinforcement and other corporate communication methods. Management should aim to motivate others in achieving these safety outcomes, and messages and behaviours must be consistent. This can be demonstrated through consistent inspections, risk assessments, talks and by management and supervising staff routinely following safety policies themselves. Positive behaviours should be reinforced, and inappropriate behaviour addressed as soon as possible. This can be done through emails, memos, meetings and informal meetings. Injuries and other incidents should be addressed through personal means where possible. For example, providing statistics surrounding workplace injuries may be less effective in the office or on the job site than outlining the damaging effect a workplace injury may have on a small family. Employees should feel empowered in their workplace to foster positive attitudes that value safety and overall wellbeing over profit and business. This means discouraging a workplace mentality that ignores safety procedures when under pressure or working to a deadline. Employees should be encouraged to take ownership of their own safety and the implementation of proper procedures to ensure the safety of their co-workers. Management staff can engage employees in building a positive safety culture by actively gaining their input on safety issues, rewarding good safety procedures through staff events and support of those who speak out on issues and hazards. Ensuring employees understand the possible health and safety outcomes associated with their own actions and behaviour can build a solid safety culture. Clear communication and taking a collaborative approach to identifying risks can make employees aware of possible health and safety risks directly related to their behaviour. The greater the knowledge an employee has on hazards and the ways they can be managed, the better equipped they are to deal with potentially dangerous situations in the workplace. They will be able to respond to hazards with action that complies with WHS policies and contribute to creating a leading safety culture. Safety practices are dynamic and businesses should be consistently looking to take on feedback and new findings to refine their behaviours in order to establish a leading safety culture.